Posted on April 22, 2016 at 11:28 am. 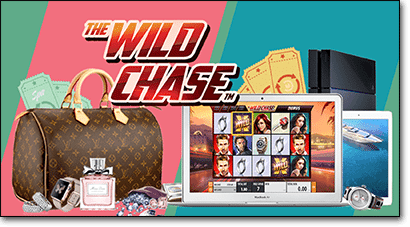 To celebrate the launch of QuickSpin’s latest video pokies game, The Wild Chase, Guts Casino is giving players the chance to join in the His ‘N Hers Heist to win daily free spins and real world prizes including iPads, MacBooks, spa vouchers and shopping sprees. All you need to do to be in the running is sign in at Guts.com between the 18th and 25th of April, make a deposit and play The Wild Chase for real money bets. For every $20 you wager on The Wild Chase during the promotional period you’ll earn five race points, along with an additional point for every $10 you deposit. If you don’t secure a place in the top five, you still walk away a winner thanks to the daily free spins bonus, where you’ll receive free spins to use on The Wild Chase every time you deposit and place a wager on this game. All wagers count, so whether your bets are placed using real money, welcome bonuses, or free spin winnings, every dollar will go towards receiving daily free spins and securing your place on the leader board. QuickSpin’s The Wild Chase pokies game is one of the most impressive releases of 2016, using vibrant, crisp graphics and packed with special features like multipliers and sticky spins. Taking inspiration from car chase films like The Fast and the Furious, Tokyo Drift and Gone in Sixty Seconds, this is a must try for car lovers or simply those with a penchant for action, and there’s no better to give it a go than during this exciting Guts promo. The Wild Chase heist promo ends on April 25th, with prize winners announced on April 27th, so get spinning today to earn race points and secure your place in the running. If you’re new to Guts Casino, sign up for an account using our links to receive up to $400 in welcome bonuses plus 100 free spins to use on Starburst.